The Darkspear Rebellion event will be ending with the release of patch 5.4, so what will become of Gahz'rooki? "Ghaz'rooki is being converted to a rare drop." We'll have to wait and see where this pet will drop and just how "rare" the droprate will be once 5.4 is released. If searching for a rare drop is not your cup of tea, there's still time before the next patch. Don't delay and head over to the Barrens to take part in the Darkspear Rebellion. 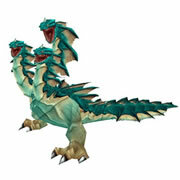 Purchase your very own baby hydra today!